DSV resides in Campus Kista in Nod Building. Visiting address: Borgarfjordsgatan 12, Kista. You can travel with the blue metro line (number 11) from Kungsträdgården or T-Centralen (direction Akalla) to Kista (estimated travel time from T-Centralen is 20 minutes). Walk out through the north ticket hall, in train direction if you arrive from Stockholm City and turn right after the escalator. Pass straight forward through Kista Galleria, pass over the footbridge, keep left, pass the Forum Building, pass over the footbridge, and turn right to the Nod Building. From the Central Station, you can take a commuter train (pendeltåg) for destination Märsta, and get off the train at Helenelund (estimated travel time is 15 minutes). From Helenelund railway station you can walk or take the bus to Kista centrum. It is also possible to take the commuter train from Arlanda airport and get off at Helenelund railway station. Take highway E4 towards Uppsala. Turn into Kista at the exit number 279. Follow Kymlingelänken to the first road junction to Kista Centrum. At the Kista roundabout take the first junction to Kistavägen. Take left to Isafjordsgatan, and take right to Borgarfjordsgatan. Take E18 and take off at exit number 279, junction to Kista, to Rinkeby. Follow Kymlingelänken to the exit towards Kista Centrum. At the Kista roundabout, take the first junction to Kistavägen. Take the left to Isafjordsgatan, and take the right to Borgarfjordsgatan. 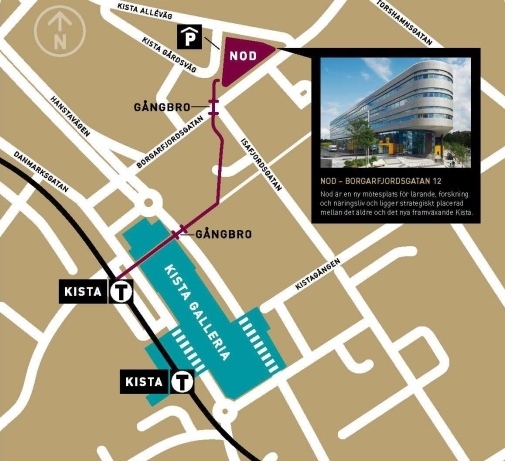 You can park on Isafjordsgatan or in the Garage Parking in Kista Galleria. Parking is allowed for on Isafjordsgatan Monday to Friday 8:00-18:00, for two hours at a time. In Kista Galleria you can park for a half hour fee.